This piece was created for the Clay Studio's 2nd annual Small Favors exhibition. Conceptually This Is Not A Pet takes a look at the psychology of how we all perceive value, and challenges the viewer to contemplate how our ideals become manipulated through marketing. Objects and resources become marks of status, revered for their identity more than their function, and to such a degree that cheaper replica copies are often produced in an effort to capitalize on people's vanity. This piece challenges us to slow down and contemplate what is really worth buying by replicating a product that was the epitome of worthless. 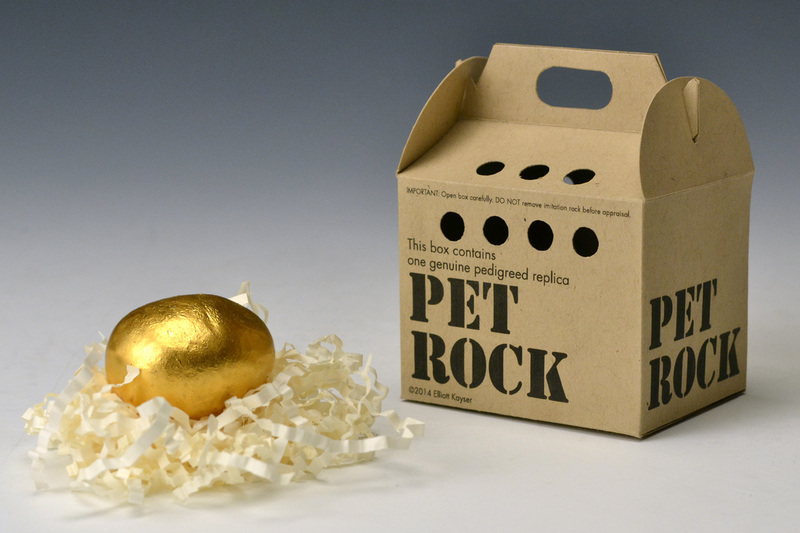 The Pet Rock's unexpected success was a triumph of marketing; so in creating a replica whose rarity is exponentially greater than the original I tied its value to the global economy benchmark, the Gold standard. The only problem with This Is Not A Pet happens to be that if someone understands the concept behind the work, they probably won't buy it...or invest in gold.